For more than 30 years, Sue Kunitomi Embrey fought to have Manzanar and the injustices that occurred there recognized by the Federal government. Her dedication and determination led to the creation of the National Historic Site in 1992. Sue remained intimately involved in Manzanar’s development and growth for the rest of her life. She helped to create the Interpretive Center and its films and exhibits. While Sue passed away in May 2006, her legacy lives on at Manzanar. 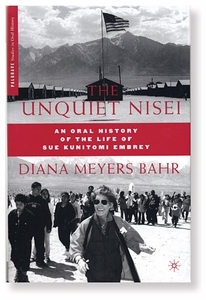 Diana Meyers Bahr’s oral-history-based biography The Unquiet Nisei captures the story of Sue’s life and passionate devotion to education and justice. It’s Sue’s story, but in many ways it is also Manzanar’s story.